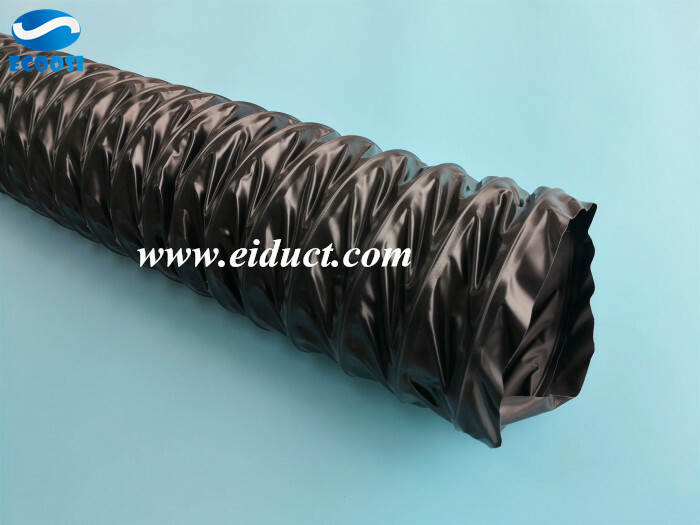 Ecoosi PVC polyester fabric air duct hose is extremely light weight and low cost, ease of installation, uniform air distribution, and a wide range of available colors and sizes. This PVC tarpaulin duct hose could used in a variety of residential, commercial, and industrial applications, one of their most popular uses is ventilation. Ventilation in indoor spaces is a vital part of many workplaces and homes; without an expanded network of HVAC and ventilated commercial hoses, our modern society may not be able to function in our urban environment. Ecoosi PVC polyester fabric air duct fabric hose is one of the most commonly used flexible ventilation hose on the market today. The PVC coating makes the hose more durable and increases the flexural fatigue strength, allowing the hose to bend continuously without damage. PVC polyester fabric hose is also typically sold in a number of different sizes. This diversity of sizes means that, regardless of your situation, we can almost guarantee the right type of flexible ventilation hose. 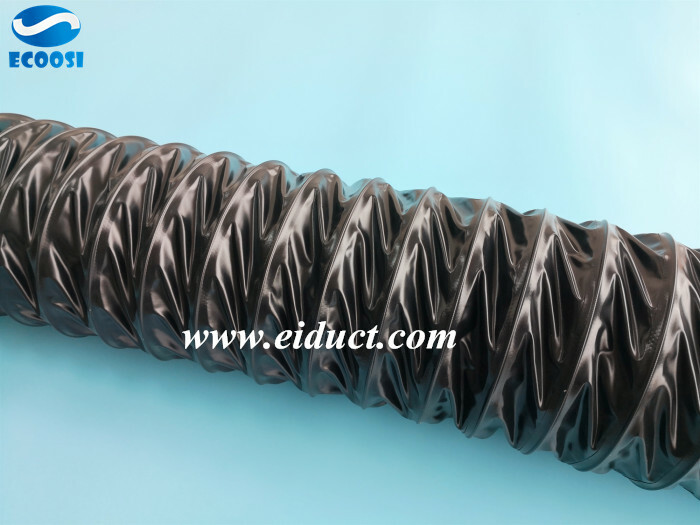 In addition, the temperature resistance of this flexible fabric hose is not sneeze; Ecoosi PVC polyester fabric air duct hose can withstand temperatures up to 120 degrees. Do not worry that this fabric air hose will be damaged when used outdoors or in a narrow, hot environment. 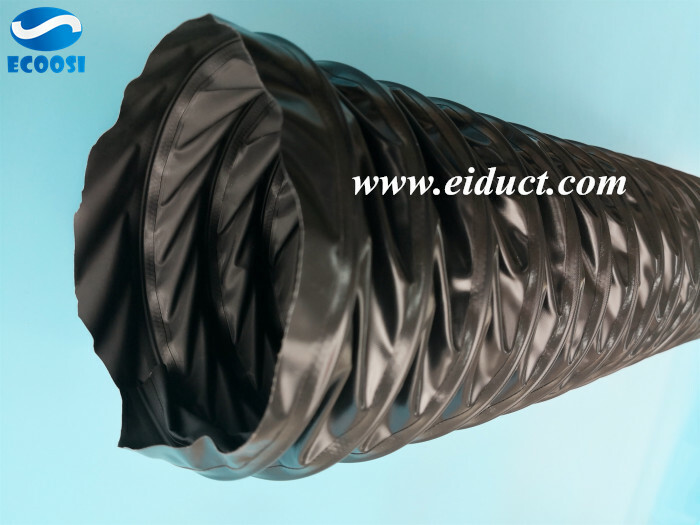 Ecoosi PVC polyester fabric air duct hose is extremely flexible and compressible. Thanks to the flexibility of lightweight fabric flexible hose, our fabric duct hose can be rotated and manipulated without creating kinks in the hose and maintaining good airflow. Therefore, this PVC flexible duct hose exhibit great flexural fatigue. The lightweight construction of the hose also allows this PVC tarpaulin hose to be extremely compressible. Ecoosi PVC fabric ventilation duct hose have a compression ratio of up to ten to one, making them easy to store and transport. The compressibility of the fabric air duct hose allows you to install thi hose that can be removed and moved as needed to meet your air and fume exhaust application needs. 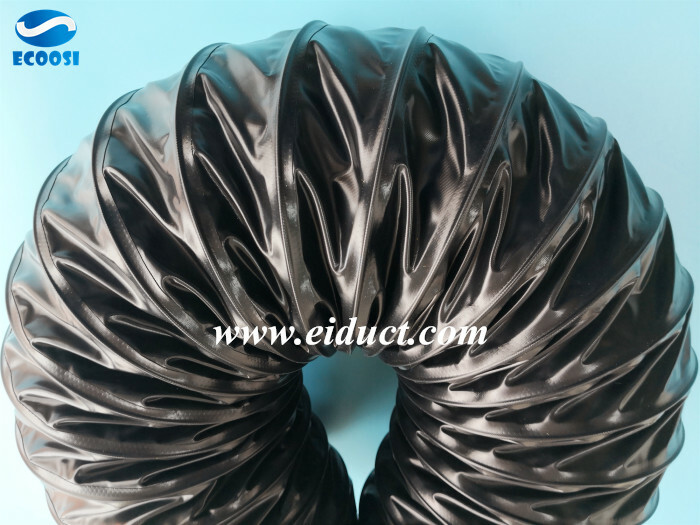 If any interests in PVC polyester fabric air duct hose please feel free to contact us through email: info@eiduct.com or Mobile(WhatsApp): 00-86-136-5140-9056, we are always here to satisfy your requirement! Pre：Why Ecoosi PU woodworking dust collection hose is ideal for collecting woodchips and wood dust? Next：What is the advantages of Ecoosi industrial portable flexible PVC air duct hose?